ps - there were NO tankers seen, none at all, BBC be damned. Work has begun to repair two damaged internet cables in the Mediterranean Sea that were severed last week. Flag Telecom, one of the firms responsible for the cables, says it will take about a week to be fixed. The break in cables has caused disruption to net services in the Middle East and India. The cause is still not known. Repairs will involve a team of about 50 people, including navigation experts and cable engineers, said Flag Telecom. The ship that will repair the first severed cable is already in place, with repairs underway, while the second vessel is expected to begin work on Tuesday. "It will be a highly technical job and should take a week to complete," a spokesperson for Flag Telecom told the BBC News website. The cause of the damage has not been officially confirmed but there have been reports that the breaks were related to a tanker dragging its anchor along the sea bed. However, the Egyptian communications ministry has denied any ships were in the area at the time of the break. The first job in such a situation was to find the exact location of the damaged cable, said Mark Harper, manager of cable system support at Cable and Wireless. The firm is not involved in the repair operation, but has carried out similar work in the past. When the pulses hit the broken part of the cable they will bounce back and by measuring the time it takes for them to return, engineers can ascertain the location of the damage to within tens of metres. The next stage is to employ a specially fitted cable ship, which will have onboard remotely operated vehicles (ROVs). If the ROV is able to locate the cable it can cut out the non-working sections and pull the cable back onto the ship. Alternatively a device onboard known as a grapnel can hook the cable from the sea floor and drag it on to the ship. "The first option is preferable because it means you can recover the cable very close to the end whereas a grapnel is less precise," said Mr Harper. Grapnels have been in use for hundreds of years, since the first telegraph cables were laid. The damaged cable can be repaired on the ship at which point a technician will splice new cable to the existing pieces. Once repaired it can be lowered back to the seabed. Two cable operators were involved in this most recent outage. 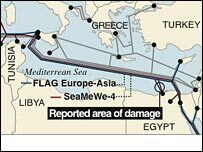 FLAG Telecoms, which has responsibility for the Fiber-Optic Link Around the Globe (FLAG), a 28,000km (17,400 mile) long submarine communications cable and SEA-ME-WE 4, or the South East Asia-Middle East-West Europe 4 project - which links South East Asia to Europe via the Indian subcontinent and the Middle East. In December 2006, seven of the eight cables connected to Taiwan were damaged by an earthquake, disrupting communications in much of Asia. These cables took several months to fully repair. Natural disasters are one of several causes of cable outages. In this case, an errant anchor has been blamed and Mr Harper believes there is "still a partial conflict between the needs of shipping and of telecoms". But it is not the biggest problem facing cable operators. "Fishing is still the biggest issue. Historically in Europe trawler fishing has been a problem although in the last 15 years most cables have been buried in the seabed to overcome this," said Mr Harper.